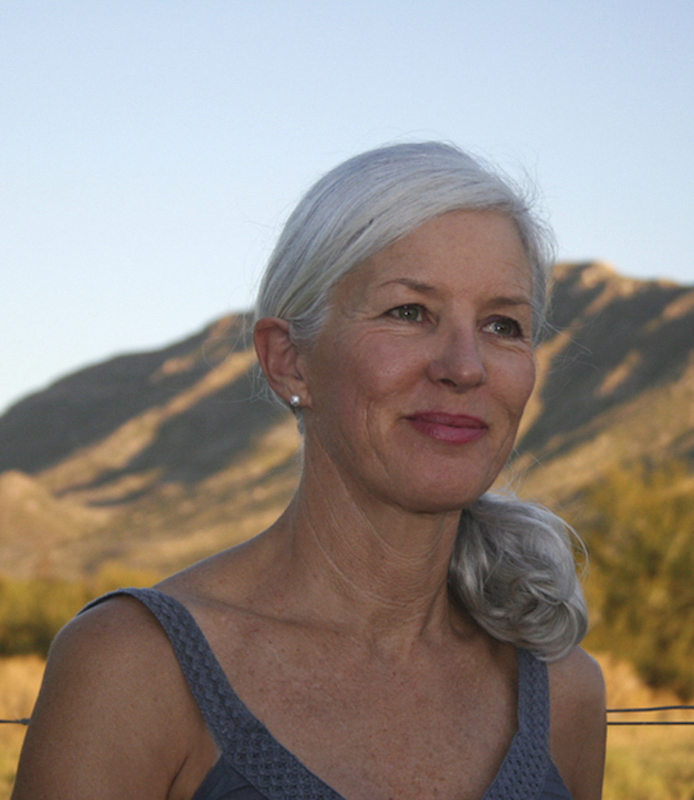 Above: Artist Sally Arnold in front of the Swartberg Mountain Range in the Great Karoo of South Africa. Photograph by Ilse Schutten. Having grown up in a suburb of a small New England town, I have always envied those who have strong emotional and physical ties to a particular landscape formed during childhood. A friend who grew up on the Irish coast and now lives in London yearns all year for the seaside, making periodic visits — if only for a day — to get her fix. Another friend who grew up in Marin County, California can remember every step of a forest trail he traversed down regularly to get to the beach. He chose to raise his family in the same area and now his daughters know that trail intimately as well. For Fabster artist Sally Arnold, the rural landscapes of her childhood in South Africa have always loomed large, becoming her main inspiration to create art. After completing her Diploma in Fine Arts at the Capetown Polytechnic, she left South Africa for Europe to study in Antwerp in 1975. One husband, two children and three cities (Munich, Rome and Luxembourg) later, Sally stayed in Europe for thirty years. Divorced in 2005, she decided to spend more time in South Africa. “Coming back to South Africa meant reclaiming part of my identity, which had been submerged after thirty years in Europe. This meant re-connecting to original values and meanings from the area where I was born and from the people who raised me.” In our interview with Sally, she tells us more about the landscape of her identity, it’s influence on her art and seeking a balance between two continents — Europe where her children, trilingual like their mother, reside and South Africa her point of origin. 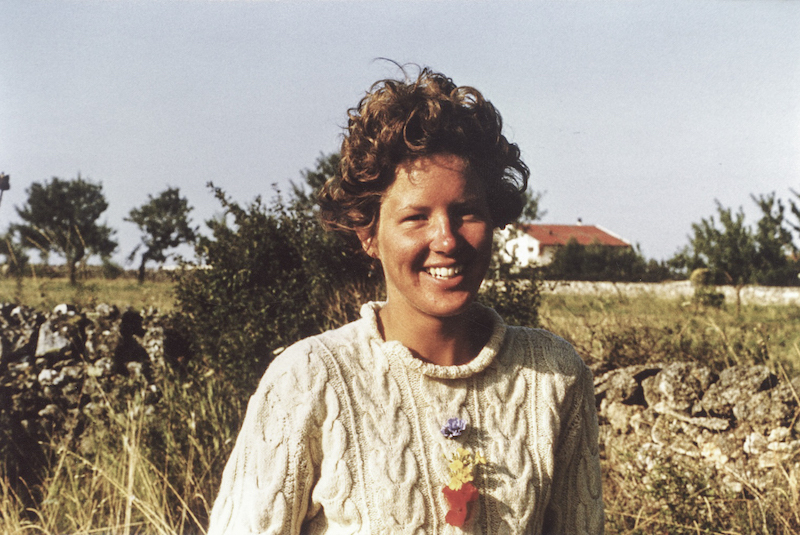 Above: Sally at the age of 22 in 1976, a year after she had moved to Europe from South Africa. She and her future husband were hitchhiking from Brindisi to Barcelona. Photograph by Tilman Seibert. Fabulous Fabsters: Please tell us more about how growing up in rural landscapes of South Africa influenced your decision on becoming an artist? 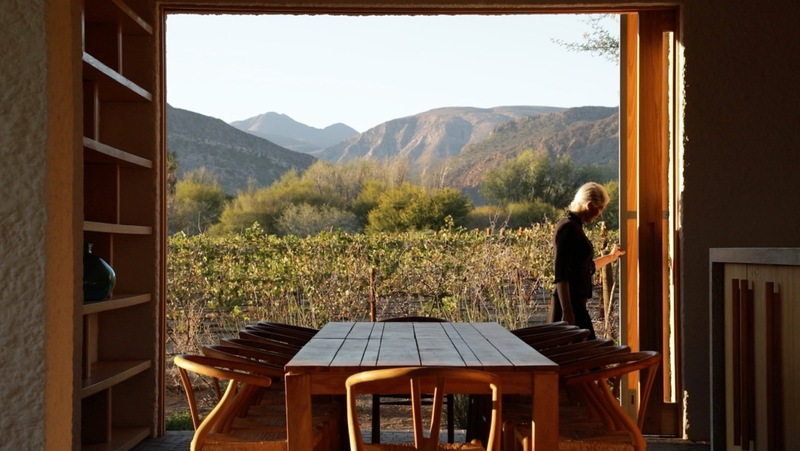 Sally Arnold: My childhood was spent at the foot of the verdant Amathola mountains, Eastern Cape — a lovely region in South Africa — and on the expanses of a sheep farm in the dry arid climate of the Great Karoo. Nature’s forms and vibrating colours were my first teachers and inspirations, driving me to draw, model and paint. With no TV, the insects and flowers of my immediate surroundings were my visual stimulation. Observation was crucial, and constituted the difference between danger and safety. I started drawing with a stick in the dust, and only grasped the power of pen on paper when I saw a drawing my mother had done. I decided then and there it was a potent tool I wanted to master. 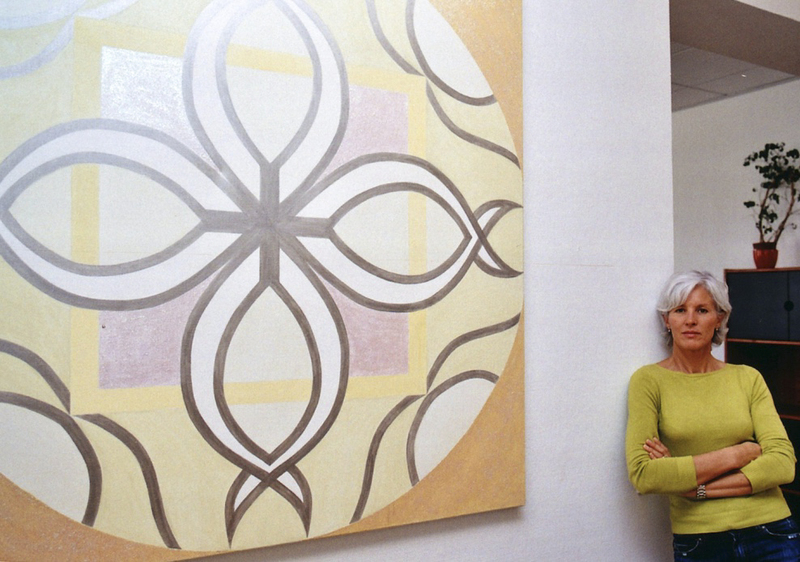 Above: Sally’s earlier work from 2001 included a twelve piece Mandala series, titled “Cosmic Flowers”. This painting is owned by IKANO S.A. Photograph by Serge Garcia Lang. FF: After your divorce and having lived in Europe for thirty years, you chose to spend more time in South Africa. What was that like? SA: In South Africa, I live on a quiet street in a small town — with only twenty thousand inhabitants. It’s situated at the foot of the Swartberg Mountains, South Africa’s second highest mountain range and is part of a Unesco World Heritage Site. This was a huge adjustment after living in some of Europe’s most beautiful cities — Antwerp, Munich, Rome and Luxembourg. Above: Sally’s current studio in the Karoo town of Prince Albert. 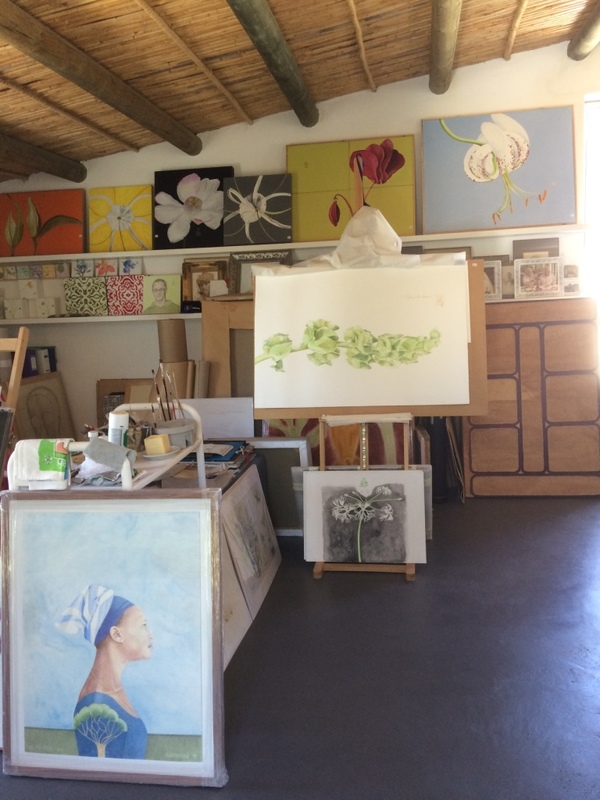 FF: Since spending more time in South Africa, you have concentrated on creating large-scale botanical paintings. How does your surrounding environment influence your current work? SA: The sculptural qualities of a bloom or plant are dramatically highlighted against the vast spaces of the Great Karoo and the crystalline quality of its light in the sky. These are hugely important aesthetic guidelines. FF: What is your intention in painting small wild flowers with great detail and at such a large scale? Above L: Sally’s painting of a Hymenocallis littoralis — originally from the Central Americas. Above R: A portrait of a Miao woman. Above L: Idalina was the subject of several of Sally’s portraits. She is originally from Cape Verde and worked for Sally in Luxembourg. “The portrait places her in a Renaissance pose and setting but with her native attributes from head scarf to the Dragon Tree on her sleeve,” Sally says. 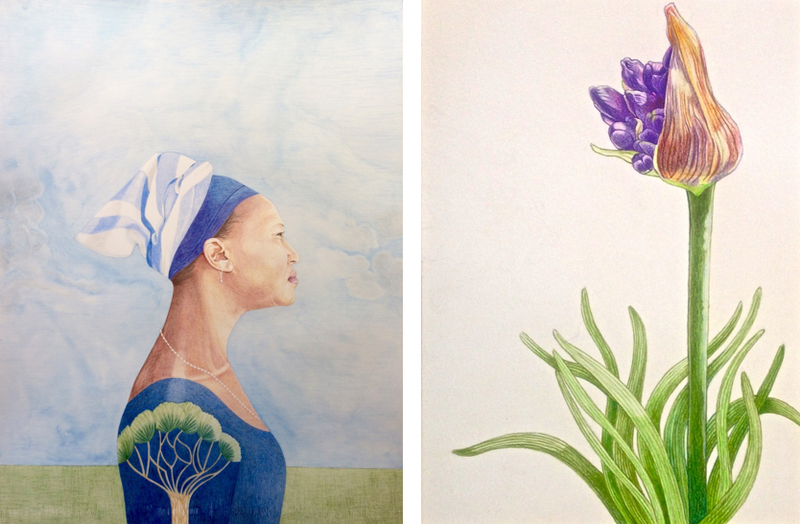 Above R: Sally’s painting of a dwarf Agapanthus africanus, which grows in her garden in Prince Albert. The sheath around the buds echoes Idalina’s headscarf. Above L: Sally’s painting of a Gerbera jamesonii, a flower that is indigenous to South Africa. Above R: A portrait of a Norwegian woman with a flower crown of twigs on her head. FF: You often paint portraits as well as flowers because the two subjects have similarities for you. Please explain? SA: Yes, a flower has a character and a personality, which can easily be paralleled by a human individual. And like flowers, humans exhibit gracefulness, unruliness, colourfulness, simplicity, power and subtlety. I look for these characteristics in both and like to find flowers whose personalities complement or accentuate my portraits and vice versa. The way people identify with interesting headgear fascinates me. Above: Gazing into the vastness of the Great Karoo in the film for the video installation of Time Space Existence, directed by Tatjana Meirelles. 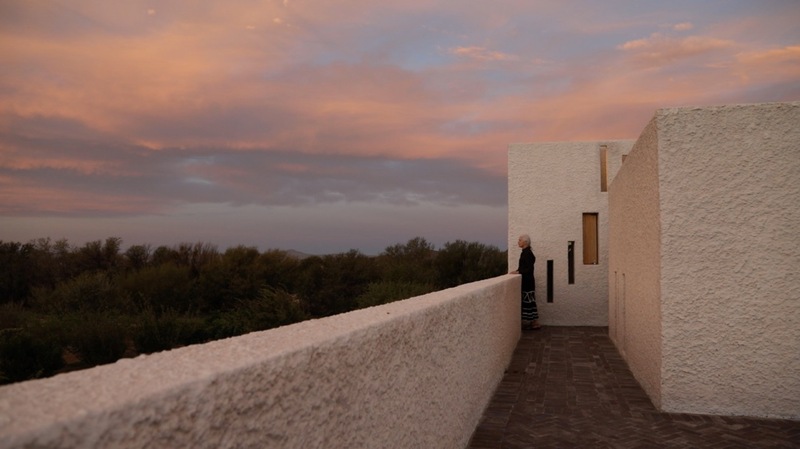 FF: You recently acted in a short film for the video installation of Time Space Existence about a day in the life of a passive solar house in the Karoo. 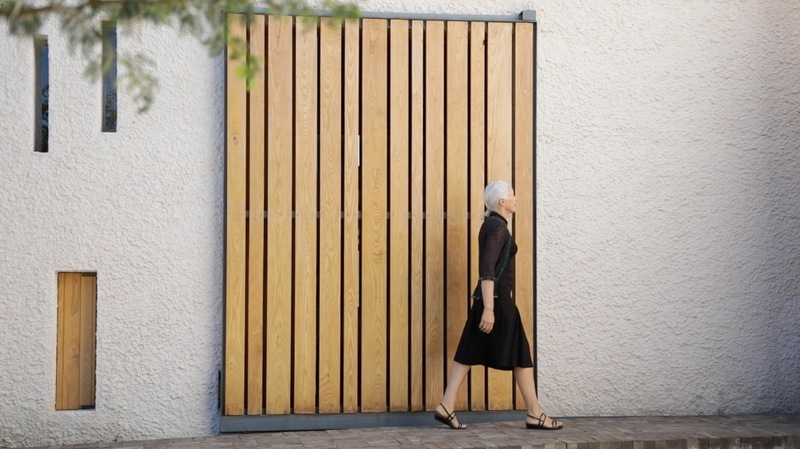 The house was designed by Jennifer Beningfield of Openstudio Architects and the video installation opened recently at the Venice Architecture Biennale. What do you enjoy most about the house and its relationship to the environment? SA: The house is situated on a large piece of land on the town’s outskirts and was clearly designed in conjunction with the surrounding rural, agricultural and mountainous aspects. It embodies the peace, harshness and ruggedness of the environment and acts as a buffer against, or a link with, the elements as needed. Above: Opening the floor to ceiling, sliding doors in the film for the video installation of Time, Space Existence, directed by Tatjana Meirelles. FF: What was your role in the film? SA: The thoughtful and considered details of the architecture allow the house to react to the environment throughout the day and the seasons as required. Designed with passive solar principles, this low-tech house relies on a human hand to enable its work. I was the enabler. FF: What does the future hold for you ? SA: I have been traveling between South Africa and Europe for the last ten years — working and spending time with my adult children who are in Vienna and Berlin. My projects are mobile and they move back and forth with me as I travel. The way I do this is to work on paper, which I can easily roll up. My biggest drawing to have travelled this way is a 10m long colour pencil study of Alpine wildflowers. I’m currently doing a distance diploma in botanical art with The Society of Botanical Artists in the UK. My assignments are posted back and forth between the UK, Luxembourg and South Africa. The future for me will ideally see me working more on bespoke botanical commissions both in Europe and South Africa, and finding substantial new opportunities to show my “drawing projects”, as I call them, in Europe. Above: Shutting down in the film for the video installation of Time, Space Existence, directed by Tatjana Meirelles. SA: I try to buy ethically – I want to know where my clothes are made, and read all the content labels. I also often make my clothes myself – my mother taught me to use a sewing machine at a young age, and dressmaking was one of my school subjects in senior school. My maternal grandfather was a tailor and I inherited his love of a well-cut garment. My modus operandi is to have good classical pieces and wear them for twenty years. The same philosophy applies to my leather shoes. Having worn uniforms at school, I have a rebellious streak too and often wear a specific colour for a specific mood. My wardrobe and shoes are therefore organised according to colours. Blues and greens predominate. Recently I’m loving what COS does. SA: I always have good pasta, Italian tomatoes in a can and the basics —especially dadi da brodo (stock cubes) for making a sugo (tomato sauce), after returning from a long trip. Also olive oil mostly from my own trees, and preserved figs from the tree outside my bedroom window. I often dream of our huge farm pantry, with row upon row of preserved peaches, quinces, jams and home baked rusks and tea biscuits. There is nothing more comforting than home-baking. I usually also have a reasonable selection of fresh fruit and vegetables. Not easy when you live in a remote area! I really miss the daily markets of Rome. Above: Swimming strong in the film for the video installation of Time, Space Existence, directed by Tatjana Meirelles. SA: Regular yoga since I was 18, peaceful surroundings and clean air. And I love to walk. Also I always have a new project, or several going at the same time. And I like to get out of my comfort zone on a regular basis. SA: Dream much bigger and believe those dreams! Don’t be sidelined by silly old patriarchs. Don’t take no for an answer – there’s always another choice! ABOVE: A PREVIEW OF THE VIDEO INSTALLATION FOR TIME SPACE EXISTENCE, GAA FOUNDATION: PALAZZO MORA, VENICE BIENNALE 2018; BY TATJANA MEIRELLES. Thanks Christine for another beautiful, interesting and informative post. Love her botanical pieces. Good writing as usual,. Christine.